While in Beaverton a few weeks ago to demonstrate pickling at the farmers' market, I stopped in Uwajimaya, the Japanese supermarket. I always come upon something amazing in Uwajimaya's produce section, and this time was no different: I found fresh lychees! 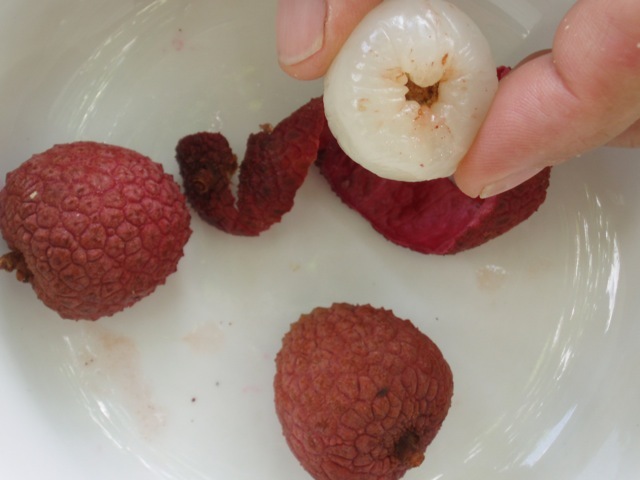 A tropical-to-subtropical fruit native to Asia, the lychee has a thin, knobbly, leathery red skin. Cut into it with a knife, fork, or fingernail, and easily peel away the skin to reveal white, fragrant flesh with a gently chewy texture like that of firm jelly. In the center of the flesh is a shiny, inedible seed approximately the size, shape, and color of a Kalamata olive. Along with its relatives the small longan and the beautiful, hairy rambutan, the lychee has long been treasured in Asia. According to Alan Davidson (The Oxford Companion to Food), during the first century a Pony Express-style courier service began bringing fresh lychees from Canton north to the imperial court of China. Later, during the Ming dynasty, clubs of lychee lovers met in temples and gardens to consume hundreds of the fruits at a sitting. I don't know where Uwajimaya got the lychees, but they were quite fresh; if they hadn't been, they would have been brown rather than red. Lychees grow in Florida and Hawaii as well as Asia, so perhaps we'll see them in Oregon more often in the future. And maybe, if I'm very lucky, someday while traveling I'll be able to pluck a ripe lychee from a tree. What did I do with the lychees? I did not preserve them. Canned lychees, easy to find in Asian markets, are bland in comparison with the fresh fruit. So I put the lychees into a bowl and sat down with my husband and son. Then we slowly unwrapped and ate our perfumed treasures one at a time until they were all gone, all the while trying to fix their look, flavor, and texture in our memories. It may be a long time before we encounter fresh lychees again.